That is the philosophy that the Pocket Mansions team abide by. And it only takes a single look at Pocket Mansions’ headlining attraction, the Maiden Mansion, to see a full commitment to the finer details. This cozy pocket mansion was dreamed up and designed by Hannah Rose Crabtree, who sought to create an elegant space that anyone would be proud to call home. All the care and precision that went into this project clearly shows in the finished product. 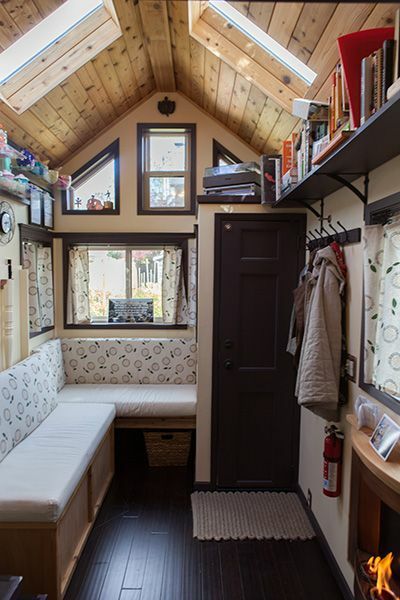 Hannah's charming little abode gained so much traction that anyone who would like to get feel for tiny living can now tour or even spend the night in this tiny mansion. 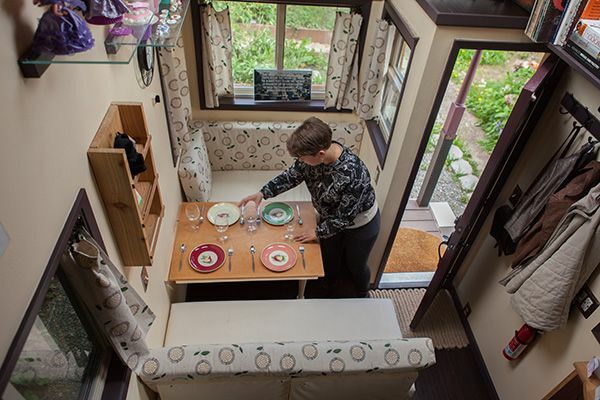 Want to make your next AirBnB stay a tiny house on wheels? Then take a look inside this gorgeous pocket manor. 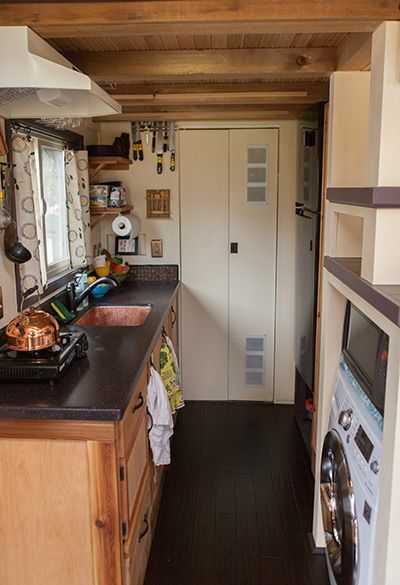 One quick glance at the outside of this 8-by-20-foot (2.4-by-6-meter) wheeled home is enough to prove that a pocket mansion is a true piece of wonder. 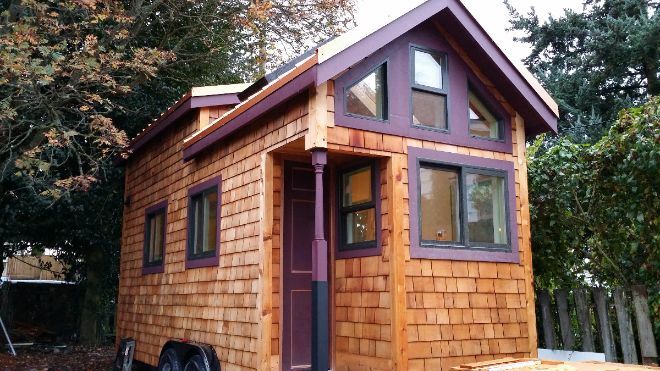 The immaculate wooden walls, the mauve detailing, a metal roof, and nicely juxtaposed windows give this tiny place a sophisticated, vibrant and modern appearance. The inside of the Maiden Mansion is a treasure of comfort and luxury. You can clearly see that every single detail has been planned to a T, from the decor to the furnishing and the wooden floors. The creamy colors, earthy tones, as well as the natural lighting coming through the skylights and windows work in perfect harmony to create a brilliant and welcoming atmosphere. The living area is adorned with matching furniture and curtains. The fireplace, shelving and little pieces of decor are a really nice touch to the interiors. And there's more. You can move the furniture around to make the living room your own dining area. Not only that, but the couches can also be rearranged to make some extra bedding for visitors. Moving straight ahead, you will find the upstairs area and the kitchen. As with the living area, the decorative details, the strategically placed furnishings and the modern windows paint a picture of pure precision. Before looking at things from above, let's head towards the kitchen. 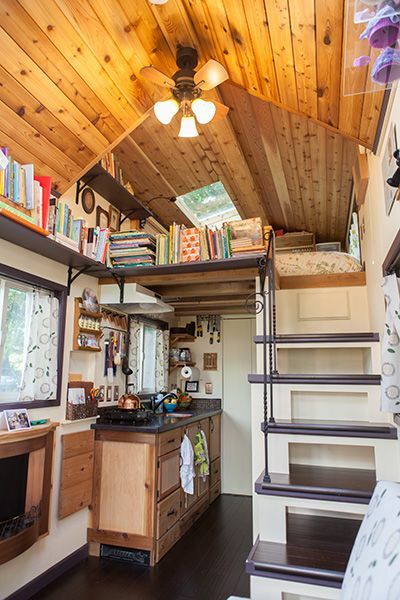 As you can see, you don’t need much space to have everything that you need to live comfortably. The design manages to incorporate all the best facilities without any sense of clutter, including a washer/dryer, a convection microwave oven, kitchen sink, a freestanding hob, large refrigerator/freezer, cupboards, decorative pieces and all the necessary kitchen utensils. That door straight ahead is not a pantry, by the way. That is actually the bathroom. You will find the toilet on the left, the shower on the right, and there is even a pull-out table that folds out over the toilet bowl if you need a bit of extra space to apply your makeup in the morning. 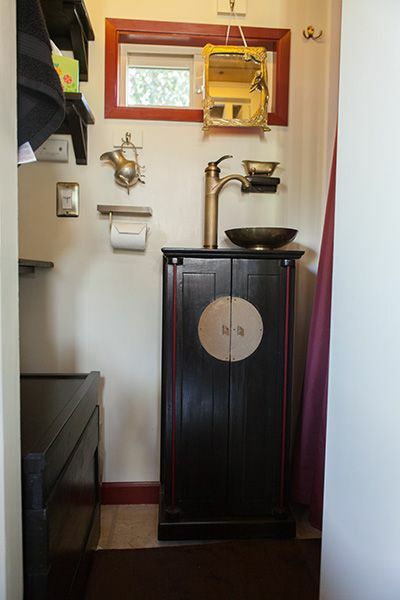 The bathroom is actually quite simple, demonstrating yet again that less is more when it comes to tiny living. You just need to add a mirror, some handsomely crafted shelving, and play around with golden hues and vibrant reds to create a lavish, antique-inspired look. Just look at the bathroom sink. 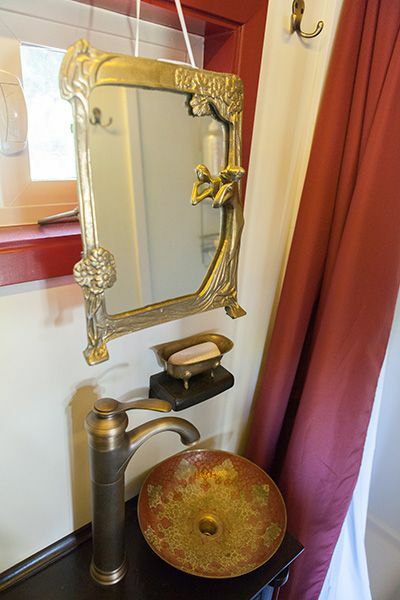 It is such a simple addition that impeccably matches the mirror, shower curtains, and even the soap dispenser. The final place to go now is the Maiden Mansion bedroom. But before we head to the final room, let's talk about these stairs. Obviously the design is beautiful, but there is a practical element to it too. 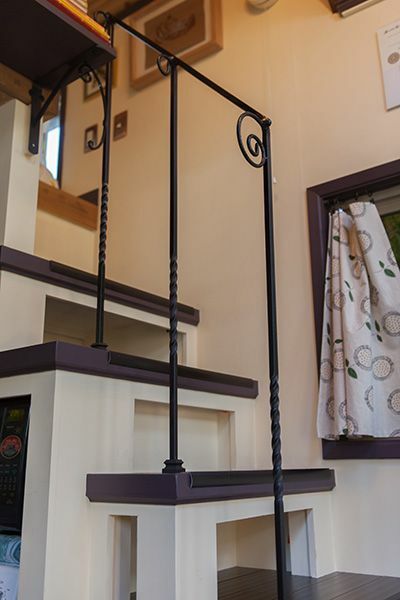 At night the steps are illuminated by lights installed underneath them, making the open-box steps are an added light source for overnight stayers. Finally, we get to the bedroom. 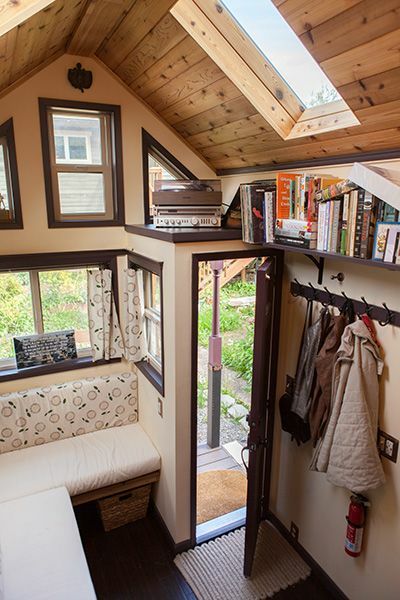 The Maiden Mansion proves that there is space for a comfy double bed in pocket-sized living. 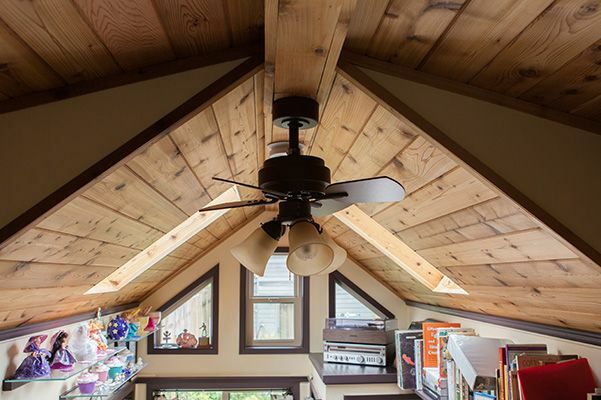 You can sleep under the stars with the added skylights, or you can snuggle up with a nice book while being illuminated by the stunning lighting fixtures on the ceiling fan. 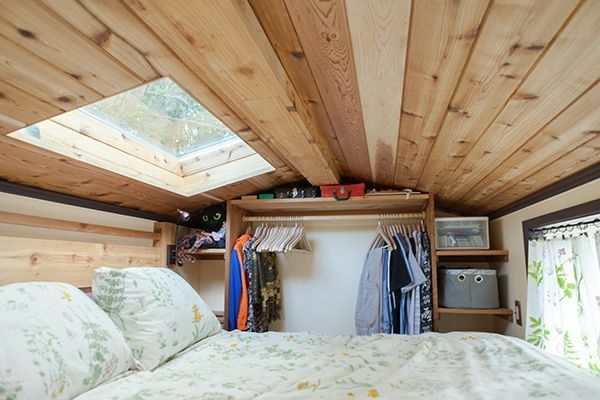 Like everywhere else, there is plenty of storage room for all your clothes and essentials too. As you can see, the Maiden Mansion is a testament to the finer details of tiny living. It is definitely a cozy abode that incorporates all the right features, in all the right places. There is not a single doubt that Hannah Rose Crabtree and the Pocket Mansions team took a great deal of care in crafting this incredible little abode so that anyone who visits can feel right at home.